Virginia Rorick was born to Woods and Martha Buller Stone, the first couple to be married in Shafter. Virginia attended Maple School, Shafter High School for two years, and Wasco High School for two years, graduating in 1936. She was off to UC Berkeley for one semester then transferred to UCLA. In 1941 she began teaching in Trona, where she and Bob Rorick met, fell deeply in love, and married in 1942. Bob was drafted into WWII and sent to England as a cryptologist, while Virginia remained in Trona teaching. In 1945 they moved to Pond and began farming. Their son Jim was born in 1946 and daughter Susan in 1948. Virginia was a model homemaker and mother and an excellent seamstress. She was Pond PTA president in 1955-57. In 1959 the family moved to Wasco. Virginia was a member of Wasco Junior Woman’s Club and its 1952-53 president and member of Wasco Woman’s Club and its 1965-66 president. 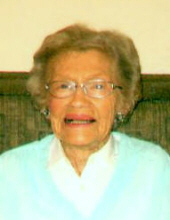 She also served as rental chairman and treasurer for many years. She was bookkeeper for Woods Stone Ranches and ran Rorick Farms after Bob had a stroke in 1965. She took wonderful care of him for sixteen years without a word of complaint. She loved politics, current events, playing bridge, doing puzzles, and reading. She was devoted, generous, intelligent, and strong. She was preceded in death by her husband in 1982, parents, and sister Venona Bergen. She is survived by her son Jim Rorick and wife Colleen, daughter Susan Bolger, grandson Patrick Bolger and wife Joleen, granddaughter Ann Bolger, great granddaughter Aubrey, sister Roma Rockwell McCaffrey, niece Nancy Bergen Wise and husband Don, and nephews John Bergen, Bob Rockwell, and Steve Rockwell. Service will be held at Grace Community Church, Wasco, on December 8 at 11am followed by burial at Wasco Cemetery. In lieu of flowers donations may be made to Wasco Community Scholarship Association. To send flowers or a remembrance gift to the family of Virginia Rorick, please visit our Tribute Store. "Email Address" would like to share the life celebration of Virginia Rorick. Click on the "link" to go to share a favorite memory or leave a condolence message for the family.